In order for parents to set up their MasteryConnect accounts and have access to real time student progress and assessments, you will need to send them an invitation (activation email). This feature is only available if your school or district has integrated their Student Information System with MasteryConnect. Click on Trackers, then click on Students. Note: The Students sub-navigation option is only available if your school or district has integrated their Student Information System with MasteryConnect. 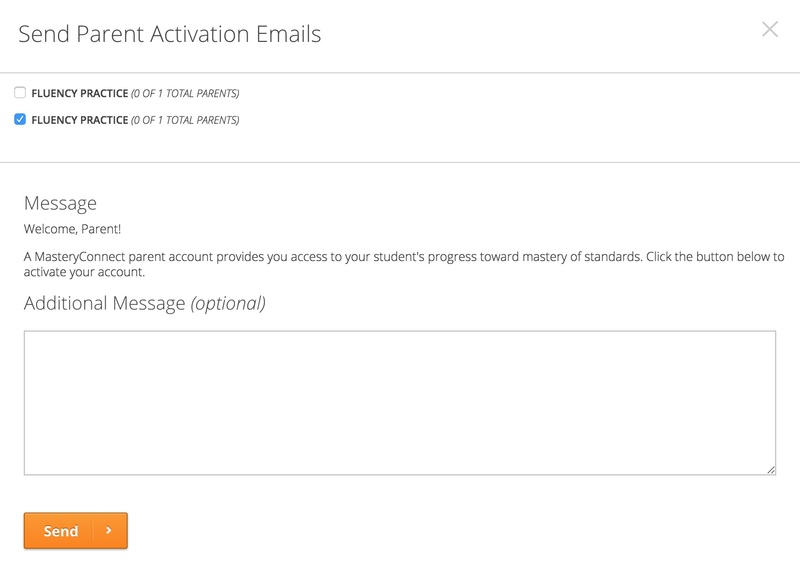 Hover over the orange menu button and select Send Parent Activation Emails. Select All Classrooms to send activation emails to parents in all classes, or select only the classes that you want to send them to. Emails will only be sent to those students who have parent email addresses entered. Enter an optional email message, and click on Send. To send activation emails to parents of individual students, find the student in your list and click on Send Parent Activation Email.